Stand up to the powerful giants of the Pathfinder campaign setting wherever they may be with the Giantslayer Poster Map Folio. Seek high adventure while battling gigantic foes or map your party's progress through the mountainous regions of the Inner Sea with these three massive poster maps designed for use with the Giantslayer Adventure Path. Cartography by Robert Lazzaretti and Ben Wootten. I can never have too many maps in my games. Particularly the big ones. I love unfolding them, laying them out on the table, and pointing to one location or another. I love the context they provide for where things are happening in the game world. And sometimes, they’re just pretty to look at. As such, I appreciate the map folios that come out for each adventure path. They help me get my fix of pointing at maps. They’re also generally useful for any games set in the same region, not just the adventure paths in their name. The Giantslayer Poster Map Folio is no exception. Like most other adventure path map folios, it comes with three fold-out poster maps, each showing a location relevant to the Giantslayer Adventure Path. The first is a map of Trunau, the town that the adventure path starts in, and where the player characters might call home. The second is a map of the Mindspin Mountains, the region where the adventure path expands into. Trunau is located towards the northeast corner, and from there, it’s possible to trace out the route the remainder of the adventure path takes. Both these maps are useful, functional, and attractive. The third map in an adventure path map folio tends to be a more artistic piece. Often, it’s a map of a country or region done in the style of a map the characters in the game might actually purchase and use, rather than one designed for gaming purposes. In this folio, it is a map of Skirgaard, the location of the fourth adventure. In this case, it’s more than just a map; it’s also an illustration of the entire village. Skirgaard is a small enough location that it’s possible to not just show where each individual location is, but to also sketch out every location in detail, complete with people moving about and smoke rising from chimneys. The map shows the village from the vantage point of a little bit above and to the south. When PCs arrive at the village, GMs no longer need to describe what they see. Instead, they can just show the map and say, “This is what you see.” The map is breathtakingly beautiful to look at, and I think it’s probably my favourite of all the artistic maps in all the adventure path map folios. 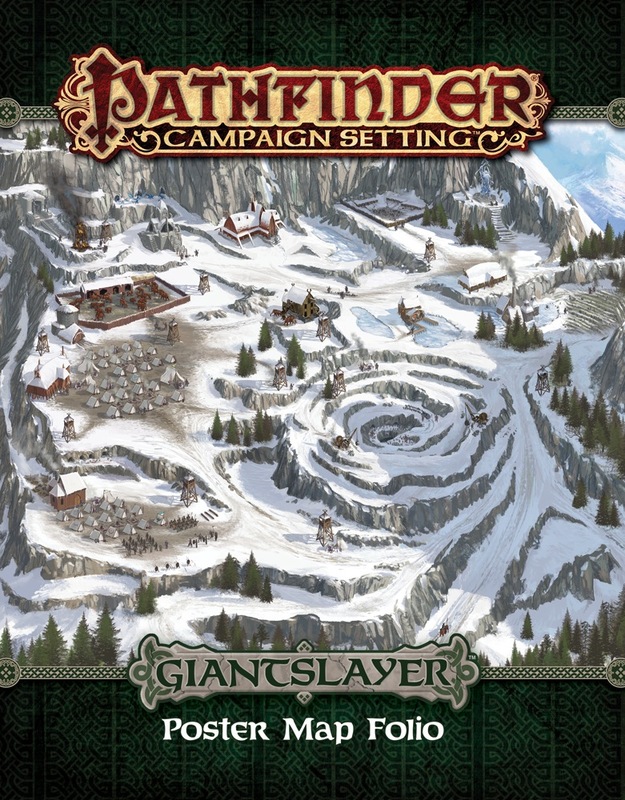 The Giantslayer Poster Map Folio makes a great addition to a Giantslayer campaign, and to any campaign set in Trunau and/or the Mindspin Mountains. Is this a change from the usual maps assortment? The majority of the Adventure Path takes place in the Mindspin Mountains. It only begins in southern Belkzen before working its way into the mountains. Yes i understand that, but it is a change from the norm as the map folios from the last 8 Adventure Paths always contained an overview of the nation it took place in. This way we get a more detailed map for the AP but not one for the Hold of Belkzen. I would like more AP-specific flip-mats but if i have the choice between a zoom-map of a mountain region and a player oriented one for Belkzen i would choose the later. The next Map Folio should be the "Hell´s Rebel´s Map Folio" and include a map of Cheliax, Kintargo and Vyre. Are locations like the Temple of Minderhal and the Kingdom of Kragnaroth marked on the map of the MMs or is it a Player-oriented map? I hope it is not unlabled as the map folios of the Shackles and Osirion - those are unusable (and needed to be replaced by the ones in "Plunder & Peril" and People of the Sands"). Kragnaroth's kingdom is not tagged on the map, but Minderhal's Valley is tagged. It's less of a player-oriented map than the pen and parchment illustrated maps, but it could still work in that role. I am looking forward to seeing the frost giant village map. I drew the original. Forgive me, this is a MICRO SPOILER, but the village is not on a flat plateau, so I drew it isomorphic style. Different height elevations are a terrain feature. I really hope it comes out well as I think it will be an exceptional and practical player aide for PCs to strategize and plan raids. Is this stuff in the AP subscription? It's in the Campaign Setting subscription. So the Jim Groves map is not in the Adventure Path stuff? Does this come as a pdf too here? The adventure contains a "normal" top-down map of the plateau, since those tend to be more useful to GMs trying to draw maps on a battlemat or flip-mat. The isomorphic map is only in the Poster Map Folio. Turns out I misremembered... I did tag Kragnaroth on the Mindspin Mountains map. Updated with final text and product image! I all but fainted when I saw this. I drew (graph paper sketch) the isomorphic map depicted. That is beyond my wildest expectations. Not to be a salesman, but I consider that map to be a must have for Chapter Four. To be clear: There is a perfectly serviceable traditional top down map in the adventure. It shows the elevations, but this would be an awesome in play aid for players who wish to devise raids and plans in advance. The map provided in Giantslayer Part 4 is far inferior to the cover map, you can see no elevations and the edges are cut off. You practically need this map to play the chapter! Has anyone gotten their map folios laminated? With this set of maps I was considering it but I wanted to be sure other people had good results with it. My only worry is that the sharp folded edges might affect the ending product. I haven't laminated this one yet, but I normally laminate all my Paizo maps (folded), and I've never had a problem. I am just getting started on this AP, and only own the first volume. I very much want to use this as a player map. How much of a spoiler problem are the labels? You mention Minderhal, and I see Skirgaard. Are there others to be aware of? What I would love is to be able to suppress all or some labels for printing. Does Paizo ever offer this function with its map folios? I know that I can finesse my way around it with warnings and misdirections, but my preference would be that it never comes up. The second is a regional map which would have been more useful when starting the adventure to figure out where Trunau is, but looking at the Belkzen map and Towns of the Inner Seas I already had the important details covered. Usefulness, minimal. Finally, the isometric map... beautiful and may or may not prove useful, to be honest I have not gotten that far. So in fairness I will say that at a minimum it is a very cool piece of art, and reserve judgement on its value as a map. That said - I expected a Map Folio for an AP to contain all the maps in one file, maybe with a draft of a map or two that didn't make the cut into a AP product as a bonus. I really do not see any value for myself in the .pdf version. For me this product was a total waste of money, and almost a total disappointment. I am sure there are people that print their own, or use projectors, etc that can draw value from this product. I can understand the product as a stand alone - it just fell so far short of what I expected for the price. I think that AP Map Folios should contain all the maps published with the AP - not necessarily as poster size. From a business standpoint providing the complete map set seems like it would be better - based on what I received, it is likely that an overwhelming percentage of those who purchase the Giantslayer AP Map Folio would be playing the AP, so providing the maps they already paid for plus this poster set should have minimal printing cost and most players/GMs love maps - it is possible that groups would pick up the folio just for some extra maps, which in turn may lead them to purchase the AP because the maps seemed interesting. Grenfax, what you want is the interactive map pdf. Which doesn't seem to be available for Giantslayer, but I'm sure will be at some point soonish (since you can get it for other previous APs). They used to produce map folios which included (nearly) every map from the AP. I personally found those great, however there were a lot of complaints each time one rolled around (many people dropped their subscriptions to skip the map folio, then resubscribed right afterwards). The feel was that such a folio was selling us material we had already bought. The current model of a few poster maps thematically tied to the AP but not actual replicas of maps within the AP started with Serpent's Skull really (Kingmaker was a special case) and were widely seen as a big improvement. BobROE - Thank you, I wasn't aware those product options existed, I looked at those products, that is closer to what I was expecting from the Map Folio. Steve Geddes - Your input based on market response makes a lot of sense and paints a clearer picture of the product option. However - the Trunau map IS a replica of the town map already available, and the isometric map is (based on earlier posts) pretty similar to the traditional top down campaign map, so it seems there is still significant duplication - at least with this particular product. I still beleive that the Map Folio would be better positioned as a paper only product - and have the Map Folio and Interactive Map .pdf be companion pieces. For what it´s worth - i think you are absolutely right when you say these make no sense as PDF´s - at least not for a price of $13.99. I buy them in paper format because they are beautiful when on the table and of great use for players. Also they show a significant part of Golarion when including a country map (this one is one of the few ones that does´nt). 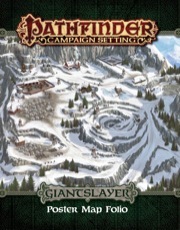 The product that you need is the "Pathfinder Adventure Path: Giantslayer Interactive Maps PDF" for $14.99. As these PDFs are available 2 to 4 month after the last installment of the AP is out, you should get it between september and november this year. The interactive maps also come with the pdfs of the adventures themselves. What if each of these AP poster map sets came with a regional map at the same scale? Someone at Paizo could grid out Avistan (I wouldn't even mind if the adventure areas were a little off center and not 100% the focus of the map), and little by little we start getting close up maps of the continent that would eventually fit together to form a massive, high-detail map of Avistan and the Inner Sea!